Roughly 10 years ago a triple reassortant swine-human-avian flu virus in Mexico - which had been evolving in pigs for more than a decade - jumped to humans and sparked the first influenza pandemic in nearly 40 years; the H1N1 `swine flu'. Pigs are susceptible to - and are able to support reassortment of - a wide range of influenza viruses (swine-origin, human & avian), and so the potential for seeing this happen again is not inconsequential. While generally less virulent than some of the avian flu viruses we've seen (H5N1, H7N9, H5N6), most swine flu viruses (H1, H2 & H3) are similar to those that have caused all of the human pandemics going back 130 years (see Are Influenza Pandemic Viruses Members Of An Exclusive Club? ), which suggest they have less far to evolve to jump to humans. 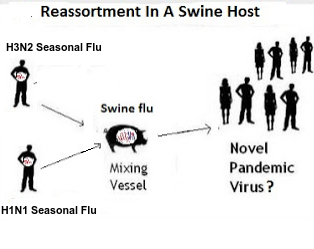 With seasonal influenza constantly re-entering the swine population and mixing with swine viruses, the building blocks (via reassortment) are available for the generation of new genotypes, some of which could potentially jump back to humans and threaten another pandemic. Yesterday the CDC's EID Journal published a research article which surveyed swine herds in Southeast Mexico, and identified 15 novel genotypes of H1 and H3 reassortant viruses in circulation. When, or even if, this ticking `swine bomb' will go off again is anyone's guess - but the greater the diversity of viruses, the greater the risk. I've only included some excerpts from a much longer report, so follow the link to read it in its entirety. When you return, I'll have a postscript. The genetic diversity of influenza A viruses circulating in swine in Mexico complicates control efforts in animals and presents a threat to humans, as shown by influenza A(H1N1)pdm09 virus. To describe evolution of swine influenza A viruses in Mexico and evaluate strains for vaccine development, we sequenced the genomes of 59 viruses and performed antigenic cartography on strains from 5 regions. We found that genetic and antigenic diversity were particularly high in southeast Mexico because of repeated introductions of viruses from humans and swine in other regions in Mexico. 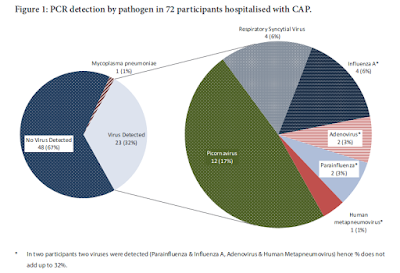 We identified novel reassortant H3N2 viruses with genome segments derived from 2 different viruses that were independently introduced from humans into swine: pandemic H1N1 viruses and seasonal H3N2 viruses. The Mexico swine viruses are antigenically distinct from US swine lineages. Protection against these viruses is unlikely to be afforded by US virus vaccines and would require development of new vaccines specifically targeting these diverse strains. The recent characterization of the origins of the influenza A(H1N1)pdm09 virus in swine in Mexico underscored the need for efforts to control the unexpectedly diverse swine IAV populations circulating in large swine herds in this country (1). Long-range animal movements between Europe, Mexico, and the United States established an exceptionally diverse population of swine IAV in the west and central-north regions of Mexico, including EAswH1N1 reassortants, which have now disseminated onward into southeast Mexico. 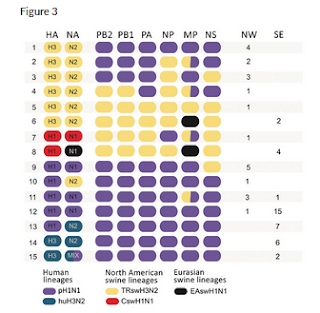 Recognition of the genetic diversity of swine IAV in Mexico, including lineages not found in US herds, has stimulated interest from producers in Mexico in developing new vaccines customized to protect against the virus strains in this country, including huH3N2 viruses in southeast Mexico that were introduced from humans in the 1990s and are highly divergent from all known US swine virus strains. The huH3N2 viruses have recently reassorted with pH1N1 viruses, generating novel reassortant genotypes that were identified frequently in southeast Mexico. Eighty percent of H3N2 viruses in swine in southeast Mexico had the HA from the huH3N2 lineage. Our analysis indicates that the huH3N2 viruses have been circulating in swine for many decades, consistent with being fit, well-adapted viruses in pigs. However, the breadth of our sampling is insufficient to draw strong conclusions about whether these viruses are widespread in southeast Mexico, and further surveillance is critical. All of which only adds more viral building blocks to the equation.